It was one of those things: I was getting ready for a shoot and had my head full of the right things to say and do and there they were, in a vase, on a big glass table. Many times I am drawn to strong colours, I LOVE colours, and I love strong contrasts. 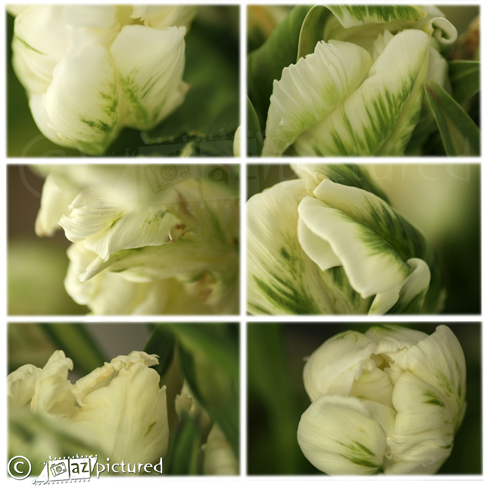 But they were quietly whispering, so, after the shoot, I hung around a bit more and tried to capture these tulips. Frilly, fragile, colourless things, they are. The green is very subtle and the white is white but then again it’s more yellow. The light was bad and my zoom lens didn’t like it much. I didn’t have my tripod so it was quite frustrating to get the flowers in focus. Looking at the photos later on the computer, I was very unhappy, because many just didn’t turn out well at all. But some did, and they make me happy. Not quite me, but then again, I still saw them, quiet and colourless and frilly as they are, so there is something about them ….